Sepsis is a life-threatening syndrome usually caused by bacterial infection. Sepsis is a response of the body's immune system that results in organ dysfunction or failure. The systemic inflammatory response syndrome (SIRS) criteria were recently replaced by the quick Sequential Organ Failure Assessment (qSOFA) in 2016, allowing for quick bedside analysis of organ dysfunction in patients with suspected or documented infection. The qSOFA score includes a respiratory rate of 22 breaths/minute or more, systolic blood pressure of 100 mm Hg or less, and altered level of consciousness. [1, 2] For completeness, severe sepsis is defined as sepsis complicated by organ dysfunction. Primary MODS is the direct result of identifiable injury or insult with early organ dysfunction (eg, renal failure due to a nephrotoxic agent or liver failure due to a hepatotoxic agent). Secondary MODS is organ failure that has no attributable cause and is a consequence of the host's response (eg, acute respiratory distress syndrome [ARDS] in individuals with pancreatitis). Septic shock is defined as sepsis with hypotension requiring vasopressor therapy to maintain a mean blood pressure of more than 65 mm Hg and a serum lactate level exceeding 2 mmol/L (18 mg/dL) after adequate fluid resuscitation. This has a greater risk of mortality and long-term morbidity. Pseudosepsis is defined as fever, leukocytosis, and hypotension due to causes other than sepsis. Examples might include the clinical picture seen with salicylate intoxication, methamphetamine overdose, or bilateral adrenal hemorrhage. Sepsis can be caused by an obvious injury or infection or a more complicated etiology such as perforation, compromise, or rupture of an intra-abdominal or pelvic structure. Other etiologies can include meningitis, head and neck infections, deep neck space infections, pyelonephritis, renal abscess (intrarenal or extrarenal), acute prostatitis/prostatic abscess, severe skin or skin structure infections (eg, necrotizing fasciitis), postsurgical infections, or systemic infections such as rickettsial infection. A more detailed discussion of sepsis etiology in various organ systems is provided in Etiology. Individuals with sepsis may present with localizing symptoms related to a specific site or source of infection or may present with nonspecific symptoms. Individuals with nonspecific symptoms are usually acutely ill with fever and may present with or without shaking chills. Mental status may be impaired in the setting of fever or hypotension. Patients with bacteremia from any source often display an increased breathing rate resulting in respiratory alkalosis. The skin of patients with sepsis may be warm or cold, depending on the adequacy of organ and skin perfusion. A detailed history and physical examination is essential in determining the likely source of the septic process (See History and Physical Examination). This helps the clinician to determine the appropriate treatment and antimicrobial therapy (see Treatment for further detail). A diagnosis of sepsis is based on a detailed history, physical examination, laboratory and microbiology testing, and imaging studies. Intravenous line infections: Consider broad-spectrum coverage for gram-positive organisms, especially methicillin-resistant Staphylococcus aureus (MRSA) (linezolid, vancomycin, or daptomycin) and gram-negative nosocomial pathogens (especially Pseudomonas species and other Enterobacteriaceae [piperacillin-tazobactam, carbapenems, or cefepime]), and line removal. Some of these may be Candida infections. Biliary tract infections: Typical bacterial agents include Enterobacteriaceae, gut-associated anaerobes, and Enterococcus. Consider carbapenems, piperacillin-tazobactam, cephalosporins, or quinolones in combination with an anaerobic agent such as metronidazole. Early surgical evaluation for presumed intra-abdominal or pelvic sepsis is essential. Procedures that may be warranted depend on the source of the infection, the severity of sepsis, and the patient’s clinical status, among other factors. Once an etiologic pathogen is identified, typically via culture, narrowed antibiotic therapy against the identified pathogen is appropriate (eg, penicillin for penicillin-susceptible Streptococcus pneumoniae). 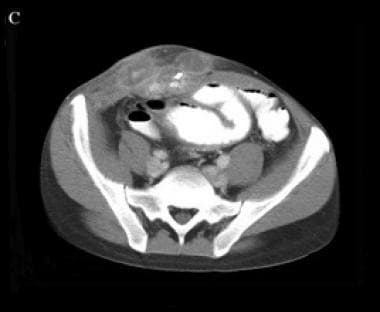 An abdominal wall abscess is depicted on the CT scan below. A right lower quadrant abdominal wall abscess and enteric fistula are observed and confirmed by the presence of enteral contrast in the abdominal wall. The pathophysiology of sepsis is complex and results from the effects of circulating bacterial products, mediated by cytokine release, caused by sustained bacteremia. Cytokines are responsible for the clinically observable effects of bacteremia in the host. [13, 14, 15, 16] Impaired pulmonary, hepatic, or renal function may result from excessive cytokine release during the septic process. The prognosis of sepsis treated in a timely manner and with appropriate therapy is usually good, except in those with intra-abdominal or pelvic abscesses due to organ perforation. When timely and appropriate therapy has been delivered, the underlying physiologic condition of the patient determines outcome. Clinical characteristics that affect the severity of sepsis and, therefore, the outcome include the host's response to infection, the site and type of infection, and the timing and type of antimicrobial therapy. Important risk factors for mortality include the patient's comorbidities, functional health status, newly onset atrial fibrillation, hypercoagulability state, hyperglycemia on admission, AIDS, liver disease, cancer, alcohol dependence, and immune suppression. Sepsis due to nosocomial pathogens has a higher mortality rate than sepsis due to community-acquired pathogens. Increased mortality is associated with bloodstream infections due to Staphylococcus aureus, fungi, and Pseudomonas, as well as polymicrobial infections. When bloodstream infections become severe (ie, septic shock), the outcome may be similar regardless of whether the pathogenic bacteria are gram-negative or gram-positive. Failure to attempt aggressive restoration of perfusion early may also be associated with an increased mortality risk. A severely elevated lactate level (>4 mmol/L) is associated with a poor prognosis in patients with sepsis. The predominant infectious organisms that cause sepsis have changed over the years. Gram-positive bacteria are the most common etiologic pathogens, although the incidence of gram-negative sepsis remains substantial. The incidence of fungal sepsis has been rising with more patients on immunosuppressive therapies and more cases of HIV infection. In approximately half of sepsis cases, the organism is not identified (culture-negative sepsis). Shankar-Hari M, Phillips GS, Levy ML, Seymour CW, Liu VX, Deutschman CS, et al. Developing a New Definition and Assessing New Clinical Criteria for Septic Shock: For the Third International Consensus Definitions for Sepsis and Septic Shock (Sepsis-3). JAMA. 2016 Feb 23. 315 (8):775-87. [Medline]. Singer M, Deutschman CS, Seymour CW, Shankar-Hari M, Annane D, Bauer M, et al. The Third International Consensus Definitions for Sepsis and Septic Shock (Sepsis-3). JAMA. 2016 Feb 23. 315 (8):801-10. [Medline]. [Full Text]. Marshall JC, Cook DJ, Christou NV, Bernard GR, Sprung CL, Sibbald WJ. Multiple organ dysfunction score: a reliable descriptor of a complex clinical outcome. Crit Care Med. 1995 Oct. 23 (10):1638-52. [Medline]. [Full Text]. Merrell RC. The abdomen as source of sepsis in critically ill patients. Crit Care Clin. 1995 Apr. 11(2):255-72. [Medline]. van Nieuwkoop C, Bonten TN, van't Wout JW, Kuijper EJ, Groeneveld GH, Becker MJ, et al. Procalcitonin reflects bacteremia and bacterial load in urosepsis syndrome: a prospective observational study. Crit Care. 2010. 14(6):R206. [Medline]. [Full Text]. Heyland DK, Johnson AP, Reynolds SC, Muscedere J. Procalcitonin for reduced antibiotic exposure in the critical care setting: A systematic review and an economic evaluation. Crit Care Med. 2011 Jul. 39(7):1792-9. [Medline]. Tang BM, Eslick GD, Craig JC, McLean AS. Accuracy of procalcitonin for sepsis diagnosis in critically ill patients: systematic review and meta-analysis. Lancet Infect Dis. 2007 Mar. 7 (3):210-7. [Medline]. [Full Text]. Lu B, Zhang Y, Li C, Liu C, Yao Y, Su M, et al. The utility of presepsin in diagnosis and risk stratification for the emergency patients with sepsis. Am J Emerg Med. 2018 Aug. 36 (8):1341-1345. [Medline]. [Full Text]. Bone RC, Balk RA, Cerra FB, Dellinger RP, Fein AM, Knaus WA, et al. Definitions for sepsis and organ failure and guidelines for the use of innovative therapies in sepsis. The ACCP/SCCM Consensus Conference Committee. American College of Chest Physicians/Society of Critical Care Medicine. Chest. 1992 Jun. 101 (6):1644-55. [Medline]. Levy MM, Fink MP, Marshall JC, Abraham E, Angus D, Cook D, et al. 2001 SCCM/ESICM/ACCP/ATS/SIS International Sepsis Definitions Conference. Crit Care Med. 2003 Apr. 31(4):1250-6. [Medline]. Marik PE. Fever in the ICU. Chest. 2000 Mar. 117 (3):855-69. [Medline]. [Full Text]. Dimopoulos G, Falagas ME. Approach to the febrile patient in the ICU. Infect Dis Clin North Am. 2009 Sep. 23 (3):471-84. [Medline]. [Full Text]. Bone RC. Sepsis and its complications: the clinical problem. Crit Care Med. 1994 Jul. 22(7):S8-11. [Medline]. Siegel JP, Stein KE, Zoon KC. Anti-endotoxin monoclonal antibodies. N Engl J Med. 1992. 327:890. Warren HS, Danner RL, Munford RS. Anti-endotoxin monoclonal antibodies. N Engl J Med. 1992 Apr 23. 326(17):1153-7. [Medline]. Kobayashi M, Tsuda Y, Yoshida T, et al. Bacterial sepsis and chemokines. Curr Drug Targets. 2006 Jan. 7(1):119-34. [Medline]. Martin GS, Mannino DM, Eaton S, Moss M. The epidemiology of sepsis in the United States from 1979 through 2000. N Engl J Med. 2003 Apr 17. 348 (16):1546-54. [Medline]. [Full Text]. Winters BD, Eberlein M, Leung J, Needham DM, Pronovost PJ, Sevransky JE. Long-term mortality and quality of life in sepsis: a systematic review. Crit Care Med. 2010 May. 38(5):1276-83. [Medline]. Sarikonda KV, Micek ST, Doherty JA, et al. Methicillin-resistant Staphylococcus aureus nasal colonization is a poor predictor of intensive care unit-acquired methicillin-resistant Staphylococcus aureus infections requiring antibiotic treatment. Crit Care Med. 2010 Oct. 38(10):1991-5. [Medline]. Frydrych LM, Bian G, O'Lone DE, Ward PA, Delano MJ. Obesity and type 2 diabetes mellitus drive immune dysfunction, infection development, and sepsis mortality. J Leukoc Biol. 2018 Sep. 104 (3):525-534. [Medline]. Peres Bota D, Lopes Ferreira F, Mélot C, Vincent JL. Body temperature alterations in the critically ill. Intensive Care Med. 2004 May. 30 (5):811-6. [Medline]. [Full Text]. Thiery-Antier N, Binquet C, Vinault S, Meziani F, Boisramé-Helms J, Quenot JP, et al. Is Thrombocytopenia an Early Prognostic Marker in Septic Shock?. Crit Care Med. 2016 Apr. 44 (4):764-72. [Medline]. [Full Text]. van Vught LA, Wiewel MA, Klein Klouwenberg PM, Hoogendijk AJ, Scicluna BP, Ong DS, et al. Admission Hyperglycemia in Critically Ill Sepsis Patients: Association With Outcome and Host Response. Crit Care Med. 2016 Jul. 44 (7):1338-46. [Medline]. [Full Text]. Neyra JA, Canepa-Escaro F, Li X, Manllo J, Adams-Huet B, Yee J, et al. Association of Hyperchloremia With Hospital Mortality in Critically Ill Septic Patients. Crit Care Med. 2015 Sep. 43 (9):1938-44. [Medline]. [Full Text]. Shorr AF, Tabak YP, Killian AD, Gupta V, Liu LZ, Kollef MH. Healthcare-associated bloodstream infection: A distinct entity? Insights from a large U.S. database. Crit Care Med. 2006 Oct. 34 (10):2588-95. [Medline]. [Full Text]. Labelle A, Juang P, Reichley R, Micek S, Hoffmann J, Hoban A, et al. The determinants of hospital mortality among patients with septic shock receiving appropriate initial antibiotic treatment*. Crit Care Med. 2012 Jul. 40 (7):2016-21. [Medline]. [Full Text]. Bassetti M, Righi E, Ansaldi F, Merelli M, Trucchi C, De Pascale G, et al. A multicenter study of septic shock due to candidemia: outcomes and predictors of mortality. Intensive Care Med. 2014 Jun. 40 (6):839-45. [Medline]. [Full Text]. Cunha BA. Empiric antimicrobial therapy for bacteremia: get it right from the start or get a call from infectious disease. Clin Infect Dis. 2004 Oct 15. 39(8):1170-3. [Medline]. Cunha BA. Antibiotic treatment of sepsis. Med Clin North Am. 1995 May. 79(3):551-8. [Medline]. Leibovici L, Paul M. Benefit associated with appropriate antibiotic treatment. Clin Infect Dis. 2007 Nov 15. 45(10):1400; author reply 1401-2. [Medline]. Johnson MT, Reichley R, Hoppe-Bauer J, Dunne WM, Micek S, Kollef M. Impact of previous antibiotic therapy on outcome of Gram-negative severe sepsis. Crit Care Med. 2011 Aug. 39 (8):1859-65. [Medline]. [Full Text]. Lange D, Zappavigna C, Hamidizadeh R, Goldenberg SL, Paterson RF, Chew BH. Bacterial Sepsis After Prostate Biopsy-A New Perspective. Urology. 2009 Oct 6. [Medline]. Sacks-Berg A, Calubiran OV, Epstein HY, et al. Sepsis associated with transhepatic cholangiography. J Hosp Infect. 1992 Jan. 20(1):43-50. [Medline]. Price CS, Hacek D, Noskin GA, et al. An outbreak of bloodstream infections in an outpatient hemodialysis center. Infect Control Hosp Epidemiol. 2002 Dec. 23(12):725-9. [Medline]. Cunha BA. Central intravenous line infections in the critical care unit. Cunha BA, ed. Infectious Diseases in Critical Care Medicine. 2nd ed. New York, NY: Informa Healthcare, Inc.; 2007. 283-7/13. Jenny-Avital ER. Catheter-related bloodstream infections. N Engl J Med. 2007 Mar 22. 356(12):1267; author reply 1268. [Medline]. Girard TD, Ely EW. Bacteremia and sepsis in older adults. Clin Geriatr Med. 2007 Aug. 23(3):633-47, viii. [Medline]. Faro S. Sepsis in obstetric and gynecologic patients. Curr Clin Top Infect Dis. 1999. 19:60-82. [Medline]. Cunha BA, Shea KW. Fever in the intensive care unit. Infect Dis Clin North Am. 1996 Mar. 10(1):185-209. [Medline]. Cunha BA. Sepsis and its mimics. Intern Med. 1992. 13:48-55. Sepsis and its mimics in the critical care unit. Cunha BA, ed. Infectious Diseases in Critical Care Medicine. 2nd Ed. New York, NY: Informa Healthcare, Inc; 2007. 73-8/4. Weinstein MP, Reller LB, Murphy JR, et al. The clinical significance of positive blood cultures: a comprehensive analysis of 500 episodes of bacteremia and fungemia in adults. I. Laboratory and epidemiologic observations. Rev Infect Dis. 1983 Jan-Feb. 5(1):35-53. [Medline]. Ristuccia PA, Hoeffner RA, Digamon-Beltran M, et al. Detection of bacteremia by buffy coat smears. Scand J Infect Dis. 1987. 19(2):215-7. [Medline]. Chant C, Smith OM, Marshall JC, Friedrich JO. Relationship of catheter-associated urinary tract infection to mortality and length of stay in critically ill patients: a systematic review and meta-analysis of observational studies. Crit Care Med. 2011 May. 39(5):1167-73. [Medline]. Carlet J. Rapid diagnostic methods in the detection of sepsis. Infect Dis Clin North Am. 1999 Jun. 13(2):483-94, xi. [Medline]. Cunha BA. Bacteremia and sepsis. Rakel RE, Bope ET, eds. Conn's Current Therapy. 2003. 68-75. Dellinger RP. Current therapy for sepsis. Infect Dis Clin North Am. 1999 Jun. 13(2):495-509. [Medline]. Mackenzie I, Lever A. Management of sepsis. BMJ. 2007 Nov 3. 335(7626):929-32. [Medline]. Morrell MR, Micek ST, Kollef MH. The management of severe sepsis and septic shock. Infect Dis Clin North Am. 2009 Sep. 23(3):485-501. [Medline]. Neu HC. General Therapeutic Principles. Infectious Diseases. Philadelphia, Pa: WB Saunders; 1992. 153. Wheeler AP, Bernard GR. Treating patients with severe sepsis. N Engl J Med. 1999 Jan 21. 340(3):207-14. [Medline]. Wiessner WH, Casey LC, Zbilut JP. Treatment of sepsis and septic shock: a review. Heart Lung. 1995 Sep-Oct. 24(5):380-92; quiz 392-3. [Medline]. Carleton SC. The cardiovascular effects of sepsis. Cardiol Clin. 1995 May. 13(2):249-56. [Medline]. Fuller BM, Dellinger RP. Hemodynamic resuscitation in septic shock: cardiovascular support and adjunctive therapy. Curr Infect Dis Rep. 2009 Sep. 11(5):357-64. [Medline]. Damian McNamara. Severe Sepsis Strategy Significantly Reduces Mortality. American College of Emergency Physicians (ACEP) 2013 Scientific Assembly. October 2013. [Full Text]. Mermel LA, Allon M, Bouza E, Craven DE, Flynn P, O'Grady NP, et al. Clinical practice guidelines for the diagnosis and management of intravascular catheter-related infection: 2009 Update by the Infectious Diseases Society of America. Clin Infect Dis. 2009 Jul 1. 49 (1):1-45. [Medline]. [Full Text]. Solomkin JS, Mazuski JE, Bradley JS, Rodvold KA, Goldstein EJ, Baron EJ, et al. Diagnosis and management of complicated intra-abdominal infection in adults and children: guidelines by the Surgical Infection Society and the Infectious Diseases Society of America. Clin Infect Dis. 2010 Jan 15. 50 (2):133-64. [Medline]. [Full Text]. Dellinger RP, Levy MM, Rhodes A, et al. Surviving sepsis campaign: international guidelines for management of severe sepsis and septic shock: 2012. Crit Care Med. 2013 Feb. 41 (2):580-637. [Medline]. Rhodes A, Evans LE, Alhazzani W, et al. Surviving Sepsis Campaign: International Guidelines for Management of Sepsis and Septic Shock: 2016. Intensive Care Med. 2017 Mar. 43 (3):304-377. [Medline]. [Full Text]. Lehman KD. Evidence-based updates to the 2016 Surviving Sepsis Guidelines and clinical implications. Nurse Pract. 2019 Feb. 44 (2):26-33. [Medline]. Barrier KM. Summary of the 2016 International Surviving Sepsis Campaign: A Clinician's Guide. Crit Care Nurs Clin North Am. 2018 Sep. 30 (3):311-321. [Medline]. [Full Text]. IDSA Sepsis Task Force . Infectious Diseases Society of America (IDSA) POSITION STATEMENT: Why IDSA Did Not Endorse the Surviving Sepsis Campaign Guidelines. Clin Infect Dis. 2018 May 2. 66 (10):1631-1635. [Medline]. [Full Text]. William BM, Corazza GR. Hyposplenism: a comprehensive review. Part I: basic concepts and causes. Hematology. 2007 Feb. 12(1):1-13. [Medline]. McNamara D. Severe sepsis strategy significantly reduces mortality. Medscape Medical News. October 16, 2013. Available at http://www.medscape.com/viewarticle/812674. Accessed: October 22, 2013. Harding A. Catheter Care Strategies Help Reduce Sepsis in Dialysis Patients. Medscape. Jan 3 2014. [Full Text]. Rosenblum A, Wang W, Ball LK, et al. Hemodialysis catheter care strategies: a cluster-randomized quality improvement initiative. Am J Kidney Dis. 2013 Nov 29. [Medline]. Gupta S, Sakhuja A, Kumar G, McGrath E, Nanchal RS, Kashani KB. Culture-Negative Severe Sepsis: Nationwide Trends and Outcomes. Chest. 2016 Dec. 150 (6):1251-1259. [Medline]. [Full Text]. O'Grady NP, Alexander M, Burns LA, Dellinger EP, Garland J, Heard SO, et al. Guidelines for the prevention of intravascular catheter-related infections. Clin Infect Dis. 2011 May. 52 (9):e162-93. [Medline]. [Full Text]. CO = cardiac output; FSP = fibrin split products; GI = gastrointestinal; GU = genitourinary; PT/PTT = prothrombin time/partial thromboplastin time; PVR = peripheral vascular resistance; WBC = white blood cell.